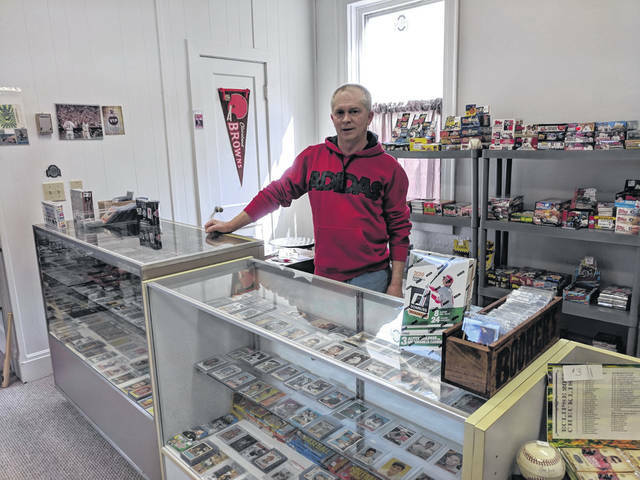 Sideline Sports has a variety of vintage sports cards available and if proprietor Barry Roberts doesn’t have it, he may be able to find it for you. Barry Roberts opened Sideline Sports full time after he retired from Honda PMC in February. Roberts, an avid collector since age 9, has thousands of cards and is willing to do consignments in his shop. 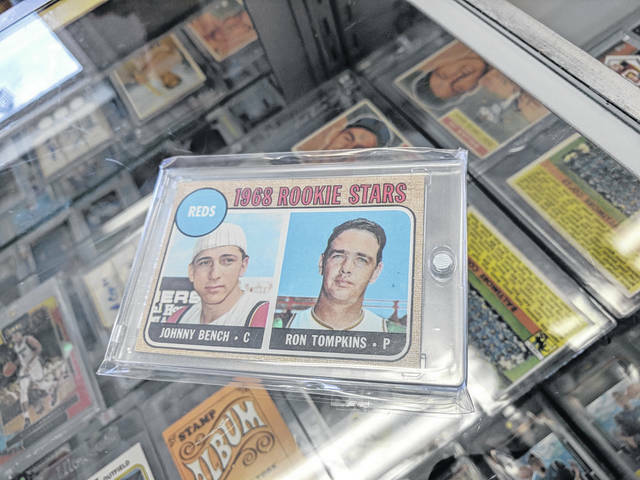 One of Barry Roberts’ prized private collection pieces is this 1968 Reds Rookie Stars card featuring Johnny Bench. He seems unwilling to part with it. When Barry Roberts began eyeing retirement, there was only one thing he could see himself doing – collecting sports memorabilia. Sure, there’s his wife and kids and he’s got a few friends kicking around. But the cards. Look at all the cards. Boxes and boxes and boxes of cards. “I’ve lugged those things from Bellefontaine to Springfield to Urbana and down here now. We had half of a small U-Haul filled up with them. My wife asked me ‘where did you have them all in that apartment?’ I had them systematically placed. I used some of them as furniture, you know,” Barry laughed. Roberts retired from Honda Performance Manufacturing in February after more than 36 years with the company. He had operated Sideline Sports, his new endeavor, part time until that point. Since then, it’s been a full-time job, complete with a brick-and-mortar location at 202 Scioto St., Unit 5. The entrance is actually just around the corner on North Locust Street, next to the former barbershop. Currently, he operates from noon to 5 p.m. Tuesday through Saturday, but is looking to add some evening hours as the weather changes and foot traffic returns to the downtown area. 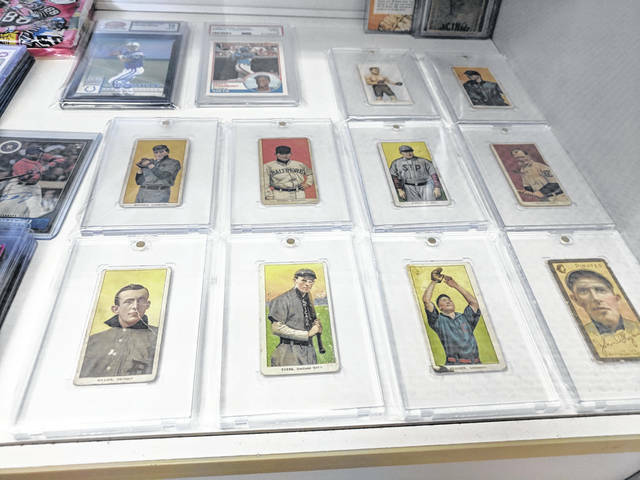 Roberts has cards ranging from 1909 to 2019, but he hasn’t set up even a fraction of his collection for display, despite putting in dozens of hours per week getting his shop ready to go with permits, signage, licenses and more. 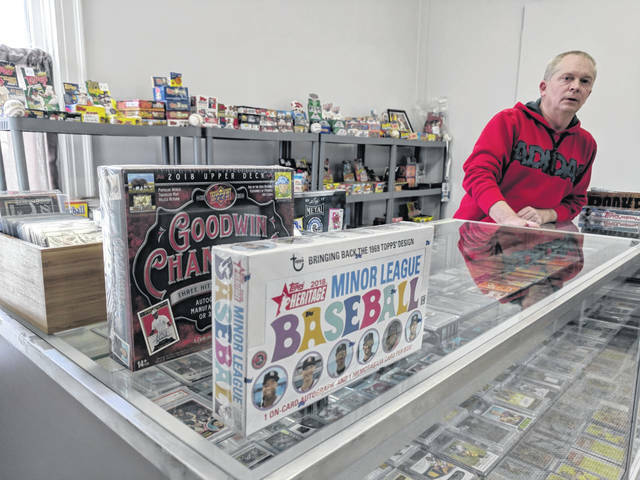 The affable 58-year-old said he’d been collecting since age 9 and is in the process of filling out his personal Cincinnati Reds and Cleveland Browns collections. Now, he’s sharing his passion with the community. His business includes a Facebook page, a Google page and a website that’s under construction. Roberts also sells on eBay. He keeps a keen eye on statistics and who may get hot. Knowing when to buy and when to sell is just as important to the collectibles business as it is to the Stock Exchange. “I do card shows at the Nutter Center and guys come around like, ‘wow, you’ve got such and such.’ When I see boxes on sale and there’s a chance there could be someone in there, I buy them up. Because there’s a chance you can make like 300 percent profit,” Roberts said. “But the new stuff is hot and cold. I try to get rid of that. I collect the vintage stuff because that’s what I like. “They’re not going to make any more of these,” he laughed, showing off his 1968 Reds Rookie Stars card featuring Johnny Bench. Not for sale, of course.